On April 7—only 27 days ago—Premier Jim Prentice jumped off of his campaign bus, holding his wife’s hand and walked confidently into an Edmonton community hall. The media snapped photos of the Premier while the crowd chanted, “Jim! Jim! Jim!” The mood was optimistic, upbeat and full of love. PC candidates were nominated in all 87 constituencies, the Premier and his Finance Minister released what they deemed to be a balanced and fair budget only 12 days earlier, and all opposition parties were in disarray. This was day one of a 28-day Alberta election campaign designed to be about Alberta’s economy. In a province where PC-majority governments have been elected for the past 44 years without pause, there was optimism and excitement for a party with an experienced and credible new leader, with a 10-year plan. PC optimism was especially high on the first campaign day because opposition parties were thought to be behind in notable leadership, organization and funding. 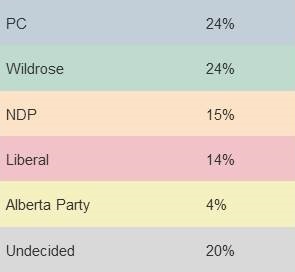 Brian Jean had only been on the job as the Wildrose leader for 10 days—he did not even have a full slate of candidates ready to be elected. Rachel Notley, the NDP leader for only six months, had little provincial exposure—Prentice had even labelled her left-leaning party extreme as he launched the campaign. The Liberal Party’s interim leader, Dr. David Swann, sounded almost apologetic for being in the race. And, the Alberta Party was hardly referenced anywhere. With such new opposing leadership dogged by an apparent lack of funding, organization and fiscally realistic plans, it was reasonable for the PCs to assume Albertans would not have time to get to know other potential premiers. Certainly Albertans would want more than a speed date before handing over the leadership of a province deemed the economic engine of Canada where the Alberta Advantage prevails. At the time of the campaign launch, Prentice was polling well enough. The data suggested to the PCs that public anger and internal disappointment over former PC premier Allison Redford’s actions remained, but the narrative of Prentice and his new administration was working: under new management; doing things differently; and for the future of the province. A Mainstreet Technology poll on March 31 asked Albertans, “Which party would you vote for if a provincial election was held today in Alberta?” The answer from slightly more than 3,000 respondents provided a compelling snapshot at that moment in time—Albertans were still largely in favor of conservative values at 48 per cent (Wildrose and PC) compared to the left-leaning parties at 33 per cent (Liberal, NDP and Alberta Party combined). The PCs assumed that Albertans were still willing to go steady–it was not on the radar for a 28-day speed date to jeopardize this renewed relationship. But what has happened is remarkable. The conservative vote’s popularity plummeted at the same time that the NDP’s left-wing agenda solidified in the capital city of Edmonton and both Notley and the NDP garnered provincial interest in less than three weeks’ time. This time, it was not fear but anger that propelled the NDP as an option to the governing PCs. Notley has managed to use every minute of her speed date to look and sound like a caring and viable option for those seeking a change from the relationship they know. Meanwhile, Prentice has faced scrutiny for his approach, and his PC family has come under greater media and public scrutiny than the other speed daters. One has to wonder if the early election call is actually giving the newest party leaders an advantage as they get to show off their best behaviours while the Tories defend the equivalent of the crazy old aunt in the political family. What remains unclear is whether or not Albertans really want to dump the PCs or if they just want to ensure that they will be treated better in the next stage of their ongoing relationship with Prentice and the PCs. What is clear is that all the leading campaigns are using these final minutes of the speed date to woo voters. Prentice is calling for stability in leadership to ensure a strong economy, which entails denouncing the NDP agenda as a jobs killer. Notley is rallying the sentiment for change with a focus on doing things differently, especially in energy and taxation. Jean is suggesting the Wildrose is the only credible right-wing choice, offering No New Taxes. The others are suggesting voters go out with anyone but Prentice. Albertans do not like change for the sake of it as much as they like to talk about it. Albertans are a passionate lot who want to know that leaders care about their relationship and will treat them with respect. I’m sure there will be shouts of “Jim!” again on May 5 but the noise may be a little quieter than it was on April 7. And, it will certainly be interesting to see just how much love was garnered in this 28-day speed dating exercise.